Hilarious Comedy "The Coffee Shop" Films! The Coffee Shop, the latest feature coming from the highly acclaimed LGBTQ film production company, Mattioli Productions, currently filming in New York City. This movie is quite unique with its episodic style as we follow the characters’ intertwined journeys throughout. The Coffee Shop is a gay owned restaurant catering to everyone in the community ranging from fabulous drag queens, to flamboyantly gay waiters, lipstick and butch lesbian waitresses, patrons questioning their sexuality and of course some bi-sexual vampire cult members. Baker plays an overbearing mother to real life daughter (Wyn Van Dusen) who is coming out of the closet to her. Baker’s unconventional reaction to this news is delightfully farcical as she is most upset that her daughter is not the “right kind” of lesbian. Goldstein plays Helen, a straight woman dating a bisexual man who leaves her for another man driving her to question her own sexuality as she is driven to search for love with another woman. Collins plays Jamie, a flamboyantly gay waiter at The Coffee Shop always observing and judging the relationships and drama unfolding around him all the while getting others into trouble merely by his fabulous existence. The cast consists of an additional twenty hilarious supporting actors creating a fantastic environment for this playful comedy. Jana (AJ) Mattioli’s directorial film debut of An Affirmative Act starring multiple Academy Award and Emmy winners and nominees, had a very successful national theatrical release in 2011. Mattioli was recently awarded for producing the “Best Comedy Short” at The Downbeach Film Festival in Atlantic City for the hysterical film, Bidentity Crisis. The film also brought home an award for Best Actor in a Short for Keith Collins and nominated for two additional awards; Best Actress in a comedy short (Elissa Goldstein) and Best Director(AJ Mattioli) in a comedy short. 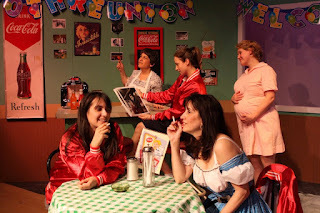 Award winning Film Director/Producer and owner of Mattioli Productions, Jana (AJ) Mattioli tries his hand at the transgender play Come Back to the 5 & Dime Jimmy Dean, Jimmy Dean opening March 9th at the Darien Arts Center. After watching a dress rehearsal we were able to speak with AJ for a bit and found out that Darien CT is not at all what he expected. He states “The talent in this cast can compete with most in NY.” “On top of the talent there is just dedication to the show and making it a success.” The gratitude expressed for antiquedress.com owner Deborah Burke for supplying all the costumes for the show. Deborah plays Sissy in the play and looks dynamite in her costume! Jana (AJ) Mattioli’s directorial film debut of An Affirmative Act starring multiple Academy Award and Emmy winners and nominees, had a very successful national theatrical release in 2011. Mattioli was recently awarded for producing the “Best Comedy Short” at The Downbeach Film Festival in Atlantic City for the hysterical film, Bidentity Crisis. The film also brought home an award for Best Actor in a Short for Keith Collins (Awake In the Woods, A Fight For Survival) and nominated for two additional awards; Best Actress in a comedy short (Elissa Goldstein) and Best Director in a comedy short. Mattioli Productions, known for serving the LGBTQ community with groundbreaking work in movie production is run by the driven and passionate Jana (AJ) Mattioli (recently honored in the Advocate as “40 People Under 40 to Look Out For.”) Directing plays like this one--with such sensitive yet timeless sexual orientation subject matter as being transgender in the 1970s--is what Mattioli Productions is all about. Educating, exposing, and entertaining for the beloved community with pride, love, tolerance and understanding is vital to this edgy director of stage and film. "Captures convincingly the atmosphere of the 1950s."-W.W.D. MOVIE SPOTLIGHT - "THE COFFEE SHOP"
The Coffee Shop tells the story of the The Cup coffee house, a gay hotspot, its workers, its regulars, and the drama it has to deal with every day. There's the owner of the shop, the fabulous Bea Reasonable (Dallas Dubois) and the flamboyant boy-crazy gay waiter, Jamie (Keith Collins). There's also Chase (Steve Wolf), the slimy creeper looking for some fun. And then there's Helen (Elissa Goldstein), a straight girl with a penchant for drama. Starring: Emmy Award Winner Blanche Baker (Sixteen Candles), Elissa Goldstein (An Affirmative Act), Rachael Robbins (The Great Fight), Julia Weldon (Before and After), Keith Collins (A Fight For Survival, Awake in the Woods), Joshua Cruz (The Big Gay Musical), and famous fabulous drag queen Dallas Dubois (Miss Fire Island 2010). Executive Producers for The Coffee Shop include Harrington Talents, Robert and Joyce Borneman, Greg Jackson, Steve Wolf and Dreamcatcher Entertainment. The Coffee Shop, will be out summer of 2012 keep an eye on this highly anticipated comedy rollercoaster that is one film not to be missed!! Shooting has started for the god help us new spin off for Jersey Shores Jwoww and Snooki titled “Jwoww and Snooki vs the world” we also hear the snookster may be expecting and hiding a baby bump? Is it possible? A Snooki spawn? The world will never be the same.. will you be watching the tanned duo’s new show? Monkees legend Davy Jones has died of a heart attack at age 66, according to media reports. Jones famous for his role in the pop group The Monkees, which got together in 1965 for the TV show of the same name. Their huge mega-hits included "Daydream Believer," "Last Train to Clarksville," "I'm a Believer."